Call of Duty: Finest Hour is a squad-based console first-person shooter set in WWII. Head to the frontlines of combat to experience intense battlefield moments from World War II's most legendary conflicts including the Russian infantry charge at Stalingrad, the British PPA Commando raids in North Africa and the American led tank charges in Belgium -- through the eyes of citizen soldiers from an alliance of countries who together helped shape the course of modern history. Take on the Nazi war machine through authentic single-player combat missions and utilize an explosive arsenal of WWII weapons from the Russian, British, American and German armories, including pistols, machine guns, sniper rifles and grenades. Play as an American, British or Russian soldier, each with his own story. The graph below charts the compatibility with Call of Duty: Finest Hour since Dolphin's 2.0 release, listing revisions only where a compatibility change occurred. 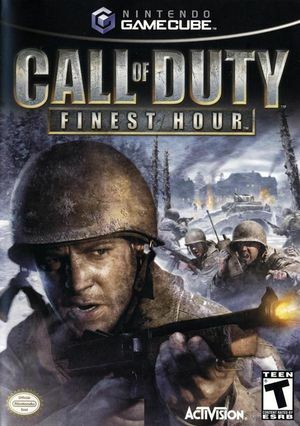 Call Of Duty: Finest Hour (Dolphin 3.0-421) Full HD (1080p) (HD)! This page was last edited on 19 March 2018, at 02:33.